Many of my friends and colleagues passed around this article, which enumerates some of the (shall we say) less accurate portions of the curriculum taught at many private Christian schools. The textbooks described play fast and loose with history (slavery wasn’t so bad! ), science (dinosaurs coexisted with humans! ), and even math (in the form of set theory, which was the foundation of the “New Math” taught in the 1960s). The last one surprised me a little, but thankfully Maggie Koerth-Baker was on the case right away; I recommend reading her article before continuing this post. 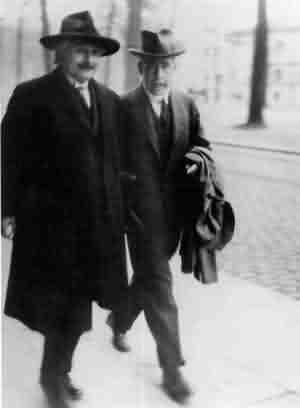 Einstein and Bohr spent a lot of time discussing the nature of quantum mechanics and reality. Einstein ultimately rejected most of the implications of quantum mechanics, showing that it isn’t just religious fundamentalists who have trouble accepting some scientific concepts. Maggie’s background is slightly different than mine, which gives her a leg up in this discussion. While we both were raised in the Midwest, her upbringing was more conservative than mine, and included a few years at a fundamentalist Christian private school. My education was solely in public schools and while I certainly didn’t learn much about evolution, my history lessons were mostly OK. My family never taught me that science and religion were opposed, and actively encouraged my interest in cosmology and astrophysics. In other words, the world of fundamentalist education is foreign to my personal experience, though I’ve met (and taught) plenty of people raised under that system. Thus, I think Maggie’s reason for opposition to something as seemingly innocuous as set theory is exactly right. The resistance to the mathematical idea of infinity—and to modernity itself—is part of a general mindset, also described in Karen Armstrong’s book The Battle for God. However, reacting fearfully to strange and complicated ideas isn’t restricted to fundamentalists by any means, much as it would be nice to think so. I’ll start with an idea I still wrestle with, and which has no 100% satisfactory explanation for me: quantum entanglement. In brief, entanglement involves a single system (usually two photons with opposite, but unknown, polarizations) split between two detectors. Measurement at one detector is correlated with the results at the other detector, even if they are separated by huge distances (as I just wrote about yesterday!). Some truly weird results come out of quantum entanglement, and thinking about them literally can keep me awake at night. Einstein never accepted entanglement, even though he was the first to write about it, and many people refuse to believe it exists, despite all the experimental evidence in its favor. The wave-particle duality: our detectors show the basic constituents of matter and light (electrons, photons, etc.) as point-like particles, but they interfere and diffract like waves. Lots of physicists are disturbed by this, though generally speaking they don’t let it interfere (heh) with their research, preferring to leave worrying about it until retirement, or after hours in the local pub. Other examples: the Heisenberg uncertainty principle (I seem to remember science fiction author Robert Heinlein hated that and repealed it in his novels), the quantum vacuum (full as it is with virtual particles popping into and out of existence). The age of the Universe is either too big or too small, from many perspectives. A young cosmos is consonant with many religious and philosophical positions, but an infinitely old Universe is more acceptable to others. (Einstein liked an infinitely old Universe, which is why he introduced his cosmological constant.) A Universe that is 13.7 billion years old is just weird from that perspective, even though the evidence supports it. Similarly, a small Universe is friendlier to our anthropocentric perspective than a huge cosmos, in which our planet is insignificant. Black holes can seem downright scary: once anything passes the event horizon, it can never return—or even communicate with the outside universe. For that reason, we’ll never know exactly what goes on inside the event horizon (though that knowledge is important for our theory of gravity and how it relates to quantum physics). The ideas of an event horizon and an infinitely dense concentration of matter are disturbing to people, not to mention the difficulty in observing them, and the sheer power of their gravitational influence. Some even reject their existence entirely, preferring other, far less plausible explanations for the phenomena we observe. Other examples: bombardment by asteroids, speed limit set by the speed of light (which pretty much rules out sending people to other stars). Maggie’s piece discussed a lot of the conceptual issues people struggle with about mathematical infinity. That includes the specific claim that only God is infinite, so mathematical infinity is dubious. However, infinity bugs other people too. One of the problems lies in the existence of two types of infinity: countable (equivalent to counting from 1 to infinity by whole numbers) and uncountable (which includes all the numbers that can’t be written in terms of whole numbers, even ratios of whole numbers), as discovered by Georg Cantor. I occasionally get comments or email from people who claim either that they have shown the two types of infinity are actually the same, or that Cantor was wrong completely (he wasn’t). Obviously there’s a lot more going on than I want to get into in this post—people (including novelist/essayist David Foster Wallace) have written whole books about the subject. Even more than infinity, two theorems in math really bother some people: Gödel’s theorem and Turing’s theorem. Gödel’s theorem states that any formal system (such as math, or symbolic logic) contains statements whose truth can’t be verified within the system. That means any mathematical system must be either inconsistent or must contain elements from “outside”: an external condition imposed on it, which may be true but unprovable. Turing’s theorem is related, though it’s usually stated as a problem in computer science instead of pure math: there are problems whose solvability can’t be determined in advance, which means if you put it into a computer, the machine might solve it, or run forever. (Anyone who has programmed computers has run into that problem, but we’re not really thinking of real programs, but a general idea.) The problem some people have with both of these theorems is that they say there are fundamental limits with what you can do: you can’t prove your math is consistent, and no matter how good you are, you’ll never prove everything within a single formal system. The evolution of humans, ultimately from single-celled organisms, is a serious blow to our egos, even for non-fundamentalists. I’ve run into a few people who are perfectly OK with evolution for other organisms, but not us. Similarly, evolution is contingent: if we restarted the world with the first organisms and let everything evolve again, it’s unlikely we would be here. We aren’t inevitable, and we aren’t the “pinnacle” of evolution, either: we are obviously well-adapted to a variety of environments, thanks in a large part to our technology, but other species have endured longer—so far at least. While it would be nice to think that only Christian fundamentalists engage in rejectionist thinking—since perhaps they do it more often and publicly than most—the lesson I take is that fear is a natural and even somewhat rational response to scary ideas. Levelheaded people react strongly to ideas that challenge their preconceptions, and that’s perfectly normal. The challenge is to keep from letting that reaction dominate us, since that can lead to something like Mythbuster Adam Savage’s ironic statement, “I reject your reality and substitute my own!” Letting ourselves be dominated by a fearful response leads directly to rejecting science when it’s uncomfortable, writing alternative histories that aren’t borne out by facts, and suppressing evidence when it doesn’t conform to the way we want the world to be. The good news, however, is that more knowledge can often help with perspective, as well as public acknowledgment that certain ideas can be disturbing to our comfort. Knowing a little bit about a subject can make it seem very frightening indeed, but knowing more can help overcome that fear…even when our overall state of knowledge is still incomplete, as with many of the topics above. It’s hard to commit to learning more, though, in part because we have to overcome our first reactions at least a little bit before we can accept challenging ideas. However, it’s a necessary step—not just for science, but for being fully informed citizens of the world. I’m hopeful we can do that, though. We may never reach the Ken Ham/William Dembski/Phillip Johnson creationist types: they have overcome their fear in the other direction, by building a calcified shell of denial around themselves, so that no uncomfortable ideas can penetrate. Intelligent as they are, they have rejected scientific reality and substituted their own. I’m confident, though, that most people are capable of grasping hard ideas, getting over their discomfort, and accepting the difficult—but glorious—concepts that lie at the heart of modern science.